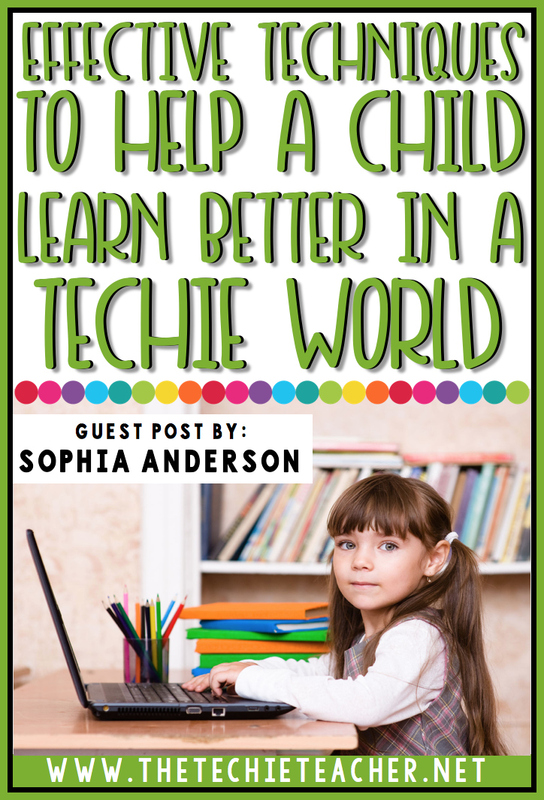 Effective Techniques to Help a Child Learn Better in a Techie World | The Techie Teacher® . While modern technology can help adults improve their lives and do things more efficiently, its influence on children has been mixed. Some may argue that many children are unable to use technology productively and fight all the distractions that come with it, such as games, cartoons, and social media, which results in their learning less. While the attitude of teachers toward modern technology differs greatly, it is slowly permeating every pore of education, so there is no going back. · since they use games as a way of learning, they can alter the children's vision of what education should be like. With that in mind, here is how you should use modern technology in order to help children learn inside an increasingly techie world. 1. Help children make a distinction between a virtual and the real world. They should learn that, even though modern technology is handy for anything from socializing to studying, it cannot be a replacement for the real world. According to Mary Beth Hertz, who is an elementary computer teacher and a blogger for Edutopia, it is up to us to make the integration of technology easier for our students and help them find their way. 2. Blend different learning styles. Educational technology today is a powerful tool for involving different styles of learning. Most children, which is about 60-80% of them, respond best to visual learning, which is why you can make use of presentations, infographics, and videos. Also, the benefits from playing a video game, such as a quick decision making and concentration, can find their way inside the classroom. 3. Introduce problem-solving learning. Teach them the importance of asking the right questions and seeking out answers. Since there are so many different tools, apps, and resources they have at their disposal, motivate them to do online research outside of the classroom in order to find quality answers. This will certainly develop their analytical skills. 4. Encourage team collaboration. These days, even in the workplace, people work as part of a team, and you need to start preparing your students for that future as soon as possible, by getting them to work in teams. Try and avoid using apps and tools which isolate the students from one another, unless they are geared toward helping them stay focused and productive. 6. Make use of spaced learning. Spaced learning will allow students to memorize and understand complex lessons, while helping them retain focus despite all the digital distractions. You can also use the same method when revising lessons. 7. Don't let typing replace writing by hand. According to James Wilson, a grammar tutor and writing expert from Essaysontime, writing by hand activates a certain part of our brain called the Reticular Activating System, which helps you prioritize the action you are performing at the moment. This means that students focus on what they are writing about when writing by hand, as opposed to typing mechanically. 8. Put an accent on reading. Video and audio materials are great for capturing the students' attention, but they don't activate the brain in quite the same way as reading, which is why you should encourage them to read. Quiz them and have them analyze the works they have read, so that they can develop their critical and analytical skills. 9. Have your students avoid multitasking. Since you will be teaching younger children, multitasking and learning don't go hand in hand. They are really distracted by modern technology as it is, and so it would be best for them to focus on just one task at a time, and then move on to the next one once they are finished. This way you will teach them concentration and set priorities on what is important. Make sure your instructions and assignments are clear enough. 10. Allow for better assessment. Every teacher should cultivate an environment where they are partners with their students. Also, the children should be able to track their own progress, based on clearly established criteria, make learning goals, and receive timely and specific feedback from their teachers. In addition to that, you should encourage students to turn to each other for learning, and develop their creative and critical abilities. Modern technology has definitely entered education for good. But, it is up to you as a teacher to select the best tools, technologies, and practices, and use them in a way that will prove to be the most beneficial for your students. Sophia Anderson is an associate educator, tutor and freelance writer. She is passionate about covering topics on learning, writing, business, careers, self-improvement, motivation and others. She believes in the driving force of positive attitude and constant development. Feel free to get in touch on Facebook.